The Robot's Guide to Love - Robot friends! Did your sentience come with a longing for love? Do love interests run from your laser eyes? Does your programming lack a flirtation protocol? Then you are holding the right coloring book! The Robot's Guide to Love features 22 pages of romantic advice sure to help any robot find a human, robot, or toaster to love. Dinosaurs With Jobs - Dinosaurs work hard for a living, and their efforts deserve to be recognized. 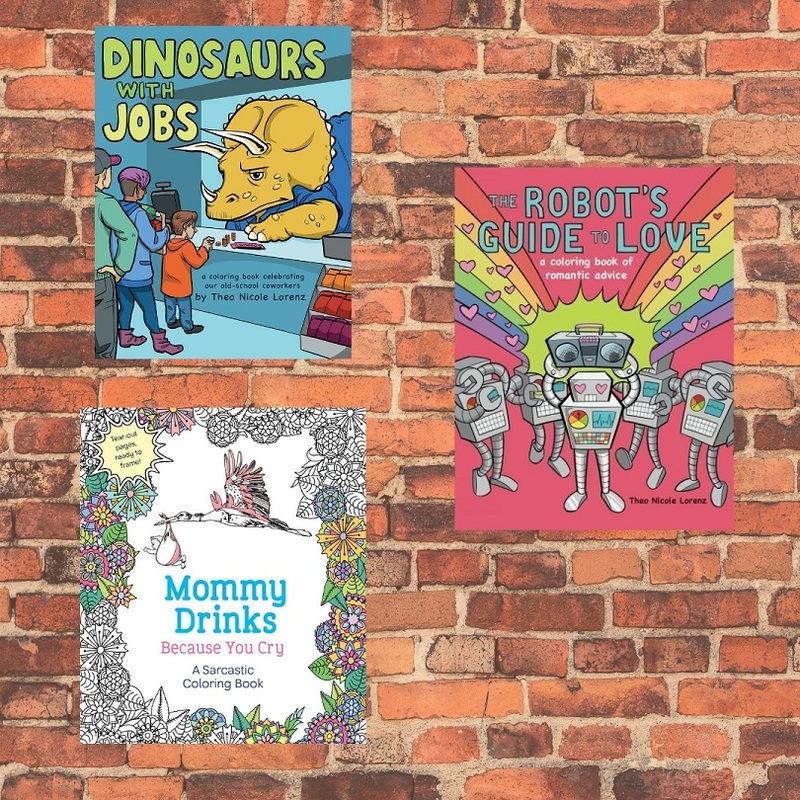 This coloring book features 20 examples of the dinosaur driving instructors, dog groomers, astronauts, tech support specialists, and more whose work makes our world a better place. Theo Nicole's Lorenz's humorous, offbeat coloring books are perfect for anyone looking to break outside the world of patterns and mandalas, and add some laughter along the way! Mommy Drinks Because You Cry: A Sarcastic Coloring Book - Pull Mommy back from the edge with this irreverent adult coloring book! For the rare moments you have to yourself, enjoy the calming act of coloring with a little dose of sass. This collection of beautiful designs and fun illustrations are paired with the very best of all our worst thoughts, from “I child-proofed my house, but they still get in,” to “Home is where the vodka is.” Each hilariously captioned design is printed on sturdy, tear-out pages perfect for amusing decoration or passive-aggressive gift-giving. When you want to unwind with coloring but aren’t in the mood to embrace sunshine and daisies, MOMMY DRINKS BECAUSE YOU CRY is the perfect adult coloring book to let you speak your native sarcasm!